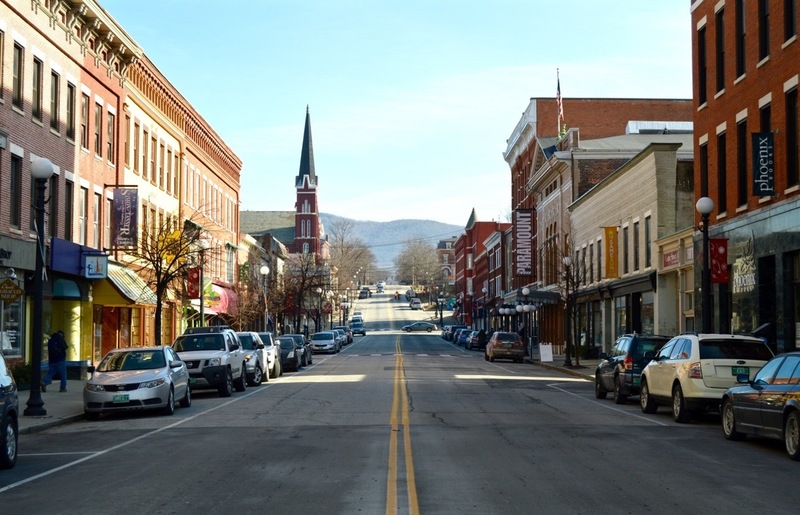 A Vermont Town In The Eye Of The Refugee Resettlement Storm : Parallels When the leaders of Rutland, an aging and ailing town, decided to host Syrian refugees, it made them a target of a national effort to oppose refugee settlement. The first families arrived this month. When the leaders of Rutland, Vt., decided to host Syrian refugees, it made them a target of a national effort to oppose refugee settlement. After a presidential campaign that divided the country on immigration, some of the most fervent anti-refugee advocates say their views and agenda have now moved into the mainstream under President Donald Trump. His appointments, including top White House advisers and his nominee for attorney general, are powerful allies who support suspending the U.S. refugee resettlement program — the largest in the world — or an outright ban on accepting refugees from "terror-prone" countries. 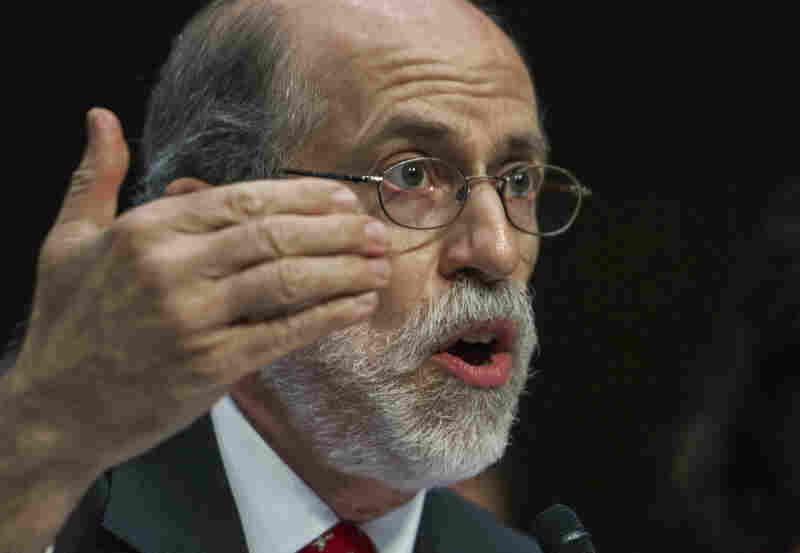 From now on, "I think you are going to see a very different attitude to the whole program and the whole problem," says Frank Gaffney, head of the Center for Security Policy and a leading anti-immigration advocate. In Barack Obama's Washington, Gaffney — described by the Southern Poverty Law Center as "one of America's most notorious Islamophobes, gripped by paranoid fantasies about Muslims destroying the West from within" — was considered on the fringe of the refugee debate. But no longer. "I would put the work we do up against anybody who is in the mainstream," Gaffney says. 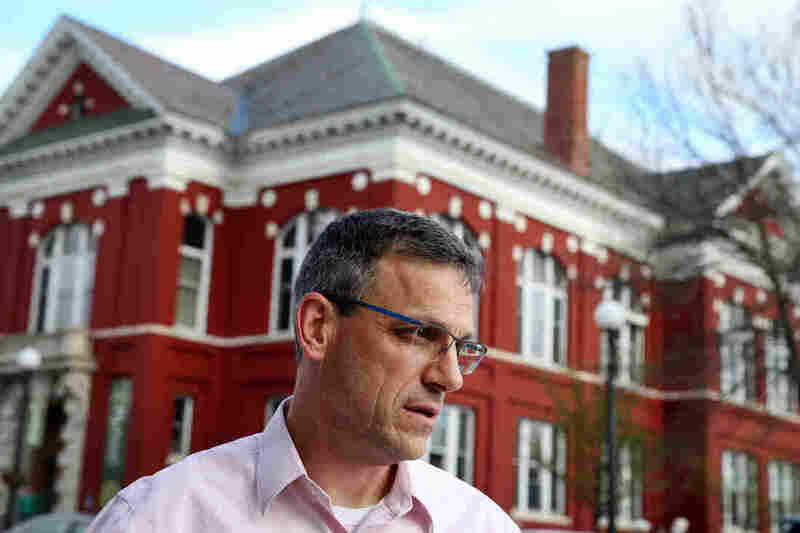 He bristles about charges that he is Islamophobic, saying, "The Southern Poverty Law Center is being used to suppress people who are telling the truth." A book rack outside Gaffney's office displays more than a dozen of his center's publications and pamphlets, with titles like Shariah, the Threat to America and Refugee Resettlement and the Hijra to America, claiming to document Muslim colonization of America. See No Shariah argues that the Muslim Brotherhood has gained undue influence over American policy makers, including the White House, FBI and Justice Department. These publications supply the talking points for a national anti-immigrant and anti-refugee campaign. One battleground is in Rutland, Vt., where some 25 Syrian refugee families are on track to resettle this year. The first two Syrian families arrived earlier this month. The controversy surrounding their resettlement has attracted widespread domestic coverage and reporters from Denmark and Canada. Rutland became a microcosm of the national debate after Mayor Christopher Louras, the grandson of Greek immigrants to Rutland, announced in April that his town would become a host community for refugees. The five-term mayor says he saw an opportunity to "do the right thing" and rebuild the community, which he describes as "96 percent white and very much trending older." The town of nearly 16,000 has lost residents since 2000, and seems unable to attract new jobs or young people. An opioid crisis has crippled some neighborhoods. Louras says Syrian refugees would be a boost for the aging town, just as immigrants from southern and eastern Europe boosted Rutland's fortunes a century ago. But there is opposition, and not just locally. "The anti-refugee people heard about it and they came to stir the pot. It was nasty and we are sorry it got so ugly," says Lavinia Limon, who heads the U.S. Committee on Refugees and Immigrants, one of nine private agencies contracted by the State Department to resettle refugees. "This is a definitely a national campaign," she says, referring to the wave of anti-refugee activists who came to Rutland. "Smaller towns seem to be their target." Rutland has also attracted the attention of the influential conservative website Refugee Resettlement Watch. The site claims 6 million readers and its editor, a Maryland woman named Ann Corcoran, says resettlement of refugees is a form of "infiltration" and is "seeding" the country for the promotion of Islamic law, or sharia. Several state legislatures are considering bills to ban sharia. The whole issue is "spurious," Limon emphasizes, because elected lawmakers, not refugees, write the laws. A month after Rutland's mayor announced the town would welcome Syrian refugees, the "Rutland First" group appeared on Facebook. The group's aims were contained in a bold, three-word manifesto: "Rutland before Refugees." Timothy Cook, a Rutland physician and one of the group's founders, contests the mayor's view that Syrian refugees can remedy the town's economic woes. "It seems a little delusional," he says as he stands in front of his medical office on a cold and foggy January night and points out businesses long closed along Rte. 7, a major thoroughfare in town. In May, soon after the mayor's announcement, Cook invited James Simpson, a national anti-immigrant and -refugee activist, to speak at the local library. Mayor Chris Louras, standing outside City Hall in Rutland, says Syrian refugees will be a boost for the aging town, just as immigrants from southern and eastern Europe boosted Rutland's fortunes a century ago. Simpson, a former analyst for the White House Office of Management and Budget, spoke to a full house at the library in an event livestreamed by Rutland's public access channel. His book, Red Green Axis: Refugees, Immigration and the Agenda to Erase America, charges that the "progressive left and Muslim extremists" aim to undermine and ultimately abolish the U.S. Constitution through Muslim resettlement and immigration. He calls the vetting of refugees and immigrants by U.S. security agencies a "sham." "I am not Islamophobic," Simpson insists. "I am concerned about national security and the costs of the [refugee] program. I'm concerned about the secrecy and the unilateral way it's imposed on communities." Louras — who says there was nothing secret or imposed about Rutland's application to host refugees — says the conversation in Rutland changed after Simpson's visit. The language got rougher, more xenophobic. "It certainly provided some false narratives and alternative facts that some people here locally glommed onto to justify their own positions." But he also says the debate in Rutland was "reflective of the national mood and the national level of discourse that Donald J. [Trump] was peddling." The roughness, for now, has somewhat abated. 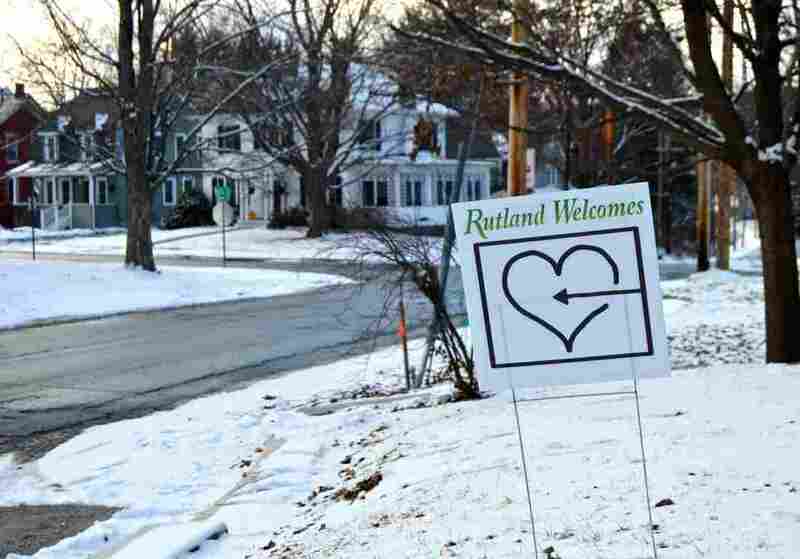 When refugees arrive in Rutland, they are likely to note signs around town featuring a white heart pierced by a thin black arrow. It is the symbol for "Rutland Welcomes," a pro-refugee group with hundreds of volunteers who have pledged to help in any way they can and organized as soon as the mayor announced that refugees would arrive. Since the State Department approved the arrivals in September, volunteer committees have filled warehouses with donated household goods, clothing and kitchen supplies. They organized school registrations for the children and lined up translators for the adults. Recently, they set up Arabic classes taught once a week by linguists from nearby Middlebury College. "I see no reason to believe that they won't be successful, "says Louras. "They want to integrate into the workforce and that's the story of our community. That's what the southern and eastern Europeans did 100 years ago. " Tim Cook, the local physician, sees these newcomers and thinks about Rutland's past. His family arrived here more than 200 years ago. He acknowledges immigrants shaped Rutland for good. But this time, he believes it's different. "We have a community that is steeped in Euro-centric culture," he says. "The idea of having a bizarre chess game where you are just going to drop people here, I have a problem with that." For now, though, Cook accepts that Syrian refugees will become part of the community. "I will do everything I can to help them succeed," he tells me a week after the first families arrived. "I'll offer medical care. I will do whatever I can do." He knows his position will surprise those who've followed his vocal opposition, but says those who are surprised should note New England culture. "That," he says, "is what Vermonters do." But he's still hoping the new president will abolish the refugee program before more Syrians arrive.